The frequency of floods has been increasing significantly in the last century in many regions, and since submergence acts as a strong selection force controlling plant distributions, understanding how plants adapt to extreme flooding events is crucial for both sustainability of natural wetland communities and crop improvements. During my doctoral work, I studied molecular and physiological basis of submergence tolerance in two Brassicaceae (mustard family) species from Rorippa genus adapted to naturally flooded habitats. We showed that, of these two species, Rorippa sylvestris achieves a higher survival by adopting a quiescence strategy that is defined by low carbohydrate consumption and no growth. This could be beneficial when floods are deep and transient, in line with R. sylvestris’ natural habitat. Contrastingly, Rorippa amphibia displays an escape strategy (with high carbohydrate consumption and stem elongation acting as a snorkel), which is an effective way to survive shallow but long-lasting floods, typical for this species’ distribution range. If you are interested here is the whole story. In order to reveal the genetic basis of these strategies, I used two approaches: candidate gene analysis and an unbiased microarray study. Differential expression patterns and sequence variation indicated importance of the analyzed candidate genes (orthologs of oxygen sensor genes in Arabidopsis and genes controlling the two strategies in rice) also in the highly tolerant Rorippa. We compared the responses of two Rumex species showing similar strategies in order to test if the mechanisms evolved in a parallel or convergent way. We also showed that these candidate genes evolved from two ancestral genes. Here is the paper co-authored by the amazing Dr. Hans van Veen. Analyzing transcriptome-wide gene regulation under submergence by using microarrays revealed that carbohydrate respiration could be an explanatory factor for tolerance differences in these Rorippa species, complementing to our previous findings. To date, this study led to three peer-reviewed publications and an invited short communication on physiology, ecology and genetics of submergence tolerance and survival strategies in Rorippa. 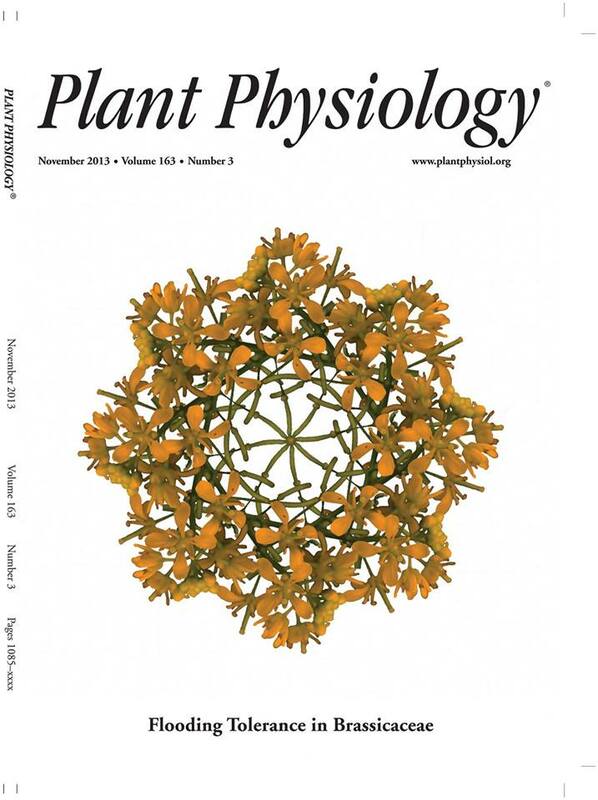 This story was also the cover story in Plant Physiology with the art work of my dissertation cover and here is the paper. And yet another short paper about the super tolerant yellow cress! In addition to my Rorippa work, I explored submergence tolerance in naturally occurring accessions of Arabidopsis thaliana, which led to the discovery of a submergence tolerance quantitative trait locus that harbors many genes potentially important for submergence sensing and survival (full text here). Complementary to this work, in a collaborative project with the Ecophysiology group in University of Utrecht, we studied gene regulation responses of eight Arabidopsis thaliana accessions under submergence by using next generation sequencing of transcriptomes. In this work, we identified genes and gene pathways that show differential regulatory patterns in tolerant and intolerant accessions. This work is published in Plant Physiology, for full text go here. This is my page where I share my academic existence and what I enjoy to explore.